One Perfect Little Miracle: Wonderful. How was your Christmas? I hope it was as wonderful as ours was. It was this little bean's first Christmas and we had the best time watching her as she "opened" her presents! I made her a little basket of soft fruits and vegetables. 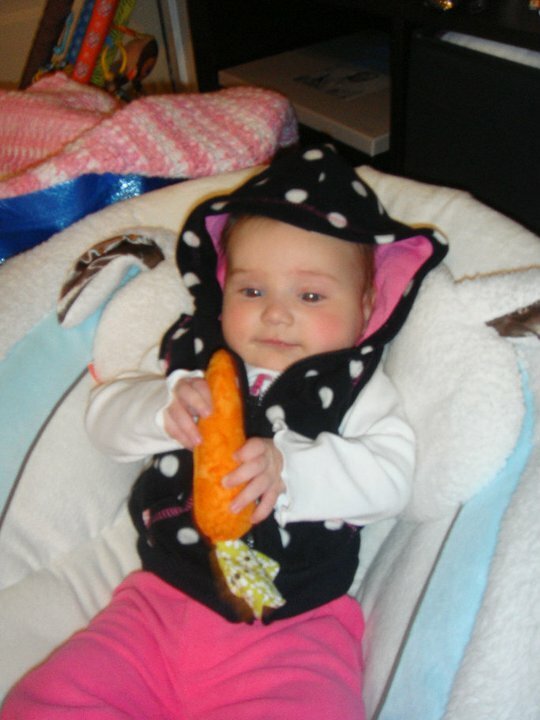 An ear of corn, a carrot, an apple, an orange, a pear and a little pod of peas. The peas are my favorite. But, Emma prefers the carrot. At least she likes her vegetables! Next year, she will be receiving Vanessa's darling stuffed turkey and some more fruits and veg, along with some desserts. Eventually, she'll have one extremely well-stocked pantry of fabric food stuffs! I also made her a knitted blanket, with big red and white stripes. It's soft and cozy and extremely squishable. Just like Emma! In other news, we had our very first official WHITE Christmas! It was lovely to see soft flakes falling to the ground, even if the did melt on contact. But, after the sun went down, the flakes stuck and made a beautiful blanket of white on the world outside. Church was cancelled due to icy roads yesterday so, we stayed inside and watched old movies- Pollyanna, The Apple Dumpling Gang, Escape to Witch Mountain, Swiss Family Robinson- and we even snuck in Despicable Me. I love that movie. Gru is hilarious. All in all, it was a quiet Christmas spent with family, the best gift of all. Sounds perfect! Christmas with that adorable baby girl what could be better than that! Awww, little Emma is soooo cute -- I'll bet you had a wonderful Christmas -- nothing like it with a baby around. Your veggies look so cute -- you need to line them all up and take a picture! ;-) Happy New Year!!! Words of Hope and Kindness.